With nothing but silence coming out of Chester this week, and within days of another MLS Cup held between teams that are not the Union, one PSP writer thought it was important to take a trip down memory lane. 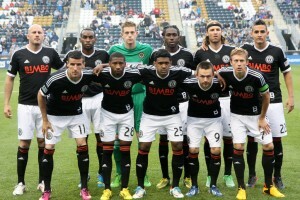 In the history of the Philadelphia Union franchise, the team has worn a total of 12 official jerseys. In the tradition of giving thanks and the Philadelphia spirit of “Airing Grievances,” we take a look at the best and worst from each of the team’s 12 historical styles. 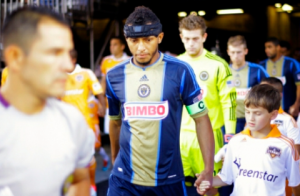 Best: The Union blue was best showcased in the team’s home opener at the Linc against D.C. United (the Le Toux hat-trick game) or in their PPL Park debut against Seattle Sounders (2010). Both were memorable wins and marked the beginning of the team’s golden-bibbed brand. Worst: A 90th minute winner by San Jose’s Arturo Alvarez capped a comeback after the homeside Union took an early lead (2010). Union fans will recognize this feeling of letdown, many will be surprised at how early on in the team’s existence that feeling was born. A tan abomination that somehow grew more charming over time, this shirt was paired with other short combinations, but to little positive effect. Best: In a come-from-behind win against New England, the Union scored twice after the 80th minute to seal a 2-1 win (2010). Worst: Finnish footballing legend, Toni Stahl, was sent off in the 39th minute of the very first Union match against Seattle Sounders (2010). His first half cameo represented the only MLS minutes he ever played. Write his name down and update your Union Quizzo scorecards accordingly, fans. No design updates came to the home shirt in 2011. However, the addition of local sponsor, Bimbo Bakeries, was either a savvy business decision or the worst thing to even happen to the shirt. Either way, the kit agreement brought another revenue stream to the fledgling Union, just in time for a playoff campaign. Best: Carlos Ruiz’s free kick that was, then wasn’t, then incredibly was is the best moment of this Union blue (2011). Though there were certainly more entertaining matches (4-4 against New England at home wins that title), this was the most epic. Worst: The Union were unbeaten at home by the end of July until their worst half of the season saw them down 2-0 against Colorado (2011). Sheanon Williams’s red card for dissent midway through the second half was the nail in the coffin. The only thing more offensive than the Union’s gold away kit was adding the logo of a local company whose name was as polarizing as it was locally unknown. Best/Worst: The Union wore white in a 3-0 away win in New England. The team wore blue in a 6-2 away win against Toronto. They wore blue again in a consecutive playoff losses to Houston. Did the team ever wear this particular gold shirt? The archives are unclear for the first team, but this picture exists of a youth side wearing it against Everton in a friendly. That’ll have to do. 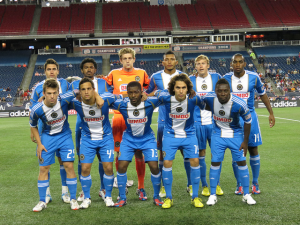 Like a $9.99 clearance kit for your Sunday team, the Union’s inaugural third jersey was generic and unmemorable. As a result, it was also little-used. Best: An 87th minute winner by Union youth product, Cristian Hernandez, lead the home side Union to a 1-0 win over visiting Everton FC (2011). It was a shining moment for Hernandez. After leaving the Union for a training stint in La Liga, he’s now a member of the New York Cosmos B side. Worst: Truly, the Union didn’t wear this shirt enough to have a bad thing happen in it. The shirt itself was the bad thing. The team’s simple original template made way for light blue accents and an unbroken front bib. This wasn’t a great home kit, but it did bring in a new color element that was interesting. Best: John Hackworth’s first win as Union head coach came in a 4-0 thumping of Kansas City (2012). Jack McInerny found his scoring boots in the 1st minute and the team never looked back. Worst: Though the Union dropped a 4-1 result against the LA Galaxy in these Blues, their most heart-wrenching loss in this shirt was a U.S. Open Cup Semifinal loss at home to Kansas City 2-0 (2012). A timid side managed only one first half shot before conceding twice after the intermission. The baby blue secondary jersey was a great look on the rack of the pro shop, but lost something on TV. Though the kit was certainly recognizable, the shade of blue was odd and the unbroken shorts and socks were a net negative. Best: Three goals in 26 minutes put the Union up 3-1 heading into half time on the road against D.C. United (2013). A second half tally from former Union man, Lionard Pajoy, was all United could do in their failed attempt at a comeback. Worst: A goal from Danny Cruz was the only bright spot in a match where Amobi Okugo was sent off and the Union fell 5-1 to New England (2013). It seemed as though Conor Casey had given the team a 2-1 lead when he poked the ball away from goalkeeper Matt Reis, but Allen Chapman disallowed the interference and the team never recovered. For many Union fans, this homage to Bethlehem Steel and the ghosts of Pennsylvania soccer past will go down as the greatest Union kit ever produced. Not simply a merchandising play for friendlies like many team’s third kits, this gem of a design was featured in the home opener, all season long, and the first cup final in which the team ever featured. Best and Worst: A 3-1 extra time loss to Seattle was as devastating a loss as the team has ever had, but the atmosphere in PPL Park was the best it’s ever been (2013). Just like the greatest regret in Mighty Ducks coach Gordon Bombay’s fictional life, Vincent Nogueira will lament a goalpost, an inch in one direction, and what might have been (the video hurts just as much today as it did back then, sadly). The home kit regained many of it’s clean lines in 2014, with a seemingly deeper navy and subtle dark, golden piping down the side. It was a unified look that integrated the sponsor better than any kit before. Best: Danny Cruz and Christian Maidana helped the Boys in Blue, deep in the weeds of a coaching change and the Rais M’Bohli disaster, to a road win against Sporting Kansas City (2014). Good hold up, smart runs, and good old-fashioned Philadelphia hustle earned them points in what has become a chippy little MLS rivalry. Worst: Andrew Wenger dribbled out of bounds (2015). Or, if that doesn’t hurt enough, perhaps the worst mistake in Union on-field history allowed Mike Grella the fastest goal in MLS history (2015). Somehow, things actually got worst for the boys from down I-95 and the team lost the match 4-1. The MLS 2.0 era of “All Teams Wear All White Away” began in boring earnest for the Union with this kit. Despite its subtle bib of stars, this blank canvas is exactly that: devoid of even the beginnings of creativity. Best: Though a two-goal, super-sub appearance from Conor Casey in a road win against San Jose is an honorable mention (2015), the team’s 4-0 annihilation of a decent but underachieving New England Revolution side is the high point (2016). The win was punctuated by Charlie Davies return to the Boston area and a 93rd minute bit of tiki-taka brilliance from the Union attack, finished by a rocket from the left boot of Roland Alberg. Worst: A huge early season match in Utah had the Union up 3-2 in the 85 minute. Maurice Edu was whistled for the softest penalty ever called, and when Salt Lake converted, the team dropped crucial road points. The golden piping gave way to Adidas trunk stripes and a snake skin-adorned the bib. The Bimbo logo kept its solid integration, too. Best: C.J. Sapong’s hat trick against the visiting Red Bulls in what looked to be a season-salvaging win is an obvious choice, but the team’s 3-1 demolition of Western Conference darlings FC Dallas wins the prize (2017). Two goals from Sapong, including arguably the team’s goal of the year, can’t be ignored. Worst: This kit has brought Union fans a substantial amount of heartbreak: Montreal’s 3 goal comeback (2017), consecutive home losses to end the 2016 season, and several late-game collapses. Perhaps the most poetic of the choices is the Union’s 1-0 loss to Houston (2016). In a winnable game against what was then a mediocre team, the Union looked completely disorganized. Former Philadelphian, Christian Maidana, curled a 95th minute free kick into the top corner to drive a dagger into his old team’s heart. Fans found out several things when the Union released their newest away kit: Mo Edu was alive and well somewhere in the Union facility, and (surprisingly) neither Ilsinho nor Josh Yaro was a particularly great dancer. Those details were neither here not there, and this was the kind of kit that teams love: it’s clean, classic, and sold out at the pro shop. Best: Oguchi Onyewu celebrated his birthday with a goal in Washington, D.C. The rest of the Union followed his lead, putting 3 more exceptional goals past the United defense (2017). Was the best Haris Medujnanin’s rocket? Fabian Herbers’s shin-credible? 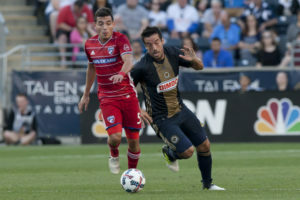 Worst: Chasing the playoffs one listless performance at a time, the Union put in one of their worst of the season in a 3-0 loss at Toronto (2017). Bad defending hurt the Union and a ruthless Toronto attack finished them off. Readers of PSP: Share with us your favorite Union kit and your best or worst memory about those threads. We can’t wait to hear about it. I think the Union kits would be much improved by trading that Guldens Spicy Brown mustard color for something a lot closer to a yellow gold. Something like the Red Bull third kit yellow. That was pretty sharp. 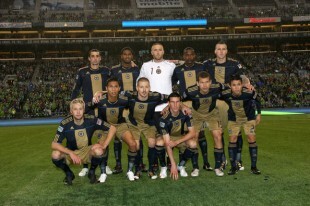 We wore the 2010 home jerseys in the Seattle game, not the away jerseys. The picture at the top of this article, which was the only time we mixed the home jerseys and the tan shorts, is from that game. Because of that hideous uniform combination, and the aforementioned Stahl red card, it should go down as the 2010 Home worst. You’re right. It was an oversight that I’ll blame on a quasi-snow-blindness caused by that kit combo. Toni Stahl – talk about Nowak’s dog house. 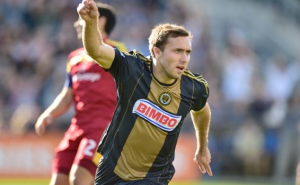 There have been many players who have made little or no appearances in Union history (did someone say Diego Gonzalez?) but that was an epic Union career. 39 minutes, a red card, and then into oblivion. He was the first but not the last. My favorite is still David Myrie. Started in that same Seattle game, then cut from the team prior to the next game. Never even made it to the home opener. When my mind wanders to short lived Union careers, I always have a wistful smile for Corben Bone. Long live the Bone Saw!!! I wouldn’t mind seeing the light blue kit come back as an alternate. 2010 Away still the greatest kit we ever had.